to the Sägewerk Gebr. VATER OHG sawmill – your capable and efficient wood supplier from the Spessart, strong partner for sawn lumber and closely ringed oak wood. OAK - quality wood from the Spessart and other domestic regions! For more than 60 years, our enterprise has been representative of outstanding quality and a wide selection of sawn timber. All the round timber comes from sustainable management of domestic forests and is transported over short distances directly to our production facility. Our range comprises all types of popular hardwood and softwood. We would be pleased to submit a detailed quotation, in due consideration of your requirements. Our sales team is looking forward to your enquiry! Precise sawing by our EDP-controlled log band saw ensures best added value of the raw material, excellent cutting precision, and a particularly smooth cutting face. Our sawn veneers are evidence thereof. Due to state-of-the-art plant technology, every log is Bark exploited by 100%, from the bark to the sawn lumber up to the sawdust. 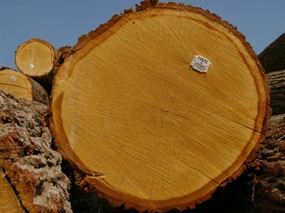 Even the first-cut boards and slabs, being by-products, are sold to customers in the form of firewood. In our modern drying chambers, we can dry sawn timber and sawn veneer at customer's request and for stock. By the use of energy-saving vacuum driers we can also react on a short-term basis. A gentle procedure as well as ample experience ensure uniform results. Based on the centuries-old tradition of sustainable forest cultivation, we use our PEFC certification to convey this idea into the future.